Learn about the statistics behind powerful predictive models with p-value, ANOVA, F-statistics. Master the statistical aspect of machine learning with the help of this example-rich guide in R & Python. Complex statistics in machine learning worries a lot of developers. Knowing statistics helps in building strong machine learning models that are optimized for a given problem statement. This book will teach you all it takes to perform complex statistical computations required for machine learning. You will gain information on statistics behind supervised learning, unsupervised learning, reinforcement learning, and more. You will see real-world examples that discuss the statistical side of machine learning and make you comfortable with it. 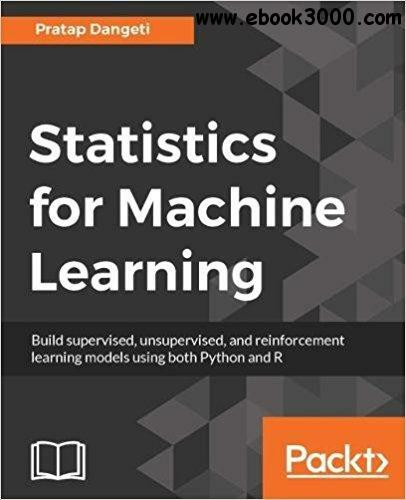 You will come across programs for performing tasks such as model, parameters fitting, regression, classification, density collection, working with vectors, matrices, and more.By the end of the book, you will understand concepts of required statistics for Machine Learning and will be able to apply your new skills to any sort of industry problems.